I’ve had the Apple Watch for a few weeks now, and enough people have asked me about what I think of it that I thought it was worth writing a post. Since the majority of reviews I’ve seen are all from tech or fashion people, and I don’t find these particularly helpful, I thought I’d give a bit of a different perspective– one from a completely normal person who just happens to have gotten one early. I have the Sport version with the 38mm case, and the white band. Let’s be real: I wouldn’t have bought this watch for myself. Despite the fabulous sums of shill money that certain antivaxxers are convinced I’m pulling in, I actually don’t have a spare $350 lying around. (If for some reason you’re burning with curiosity about what I make, go look up NSF biology postdoc salaries for a ballpark figure). The watch was an early wedding gift from my fiancé, who is both in love with being an early adapter of new tech but a staunch enemy of all things Apple. Yeah, I don’t get it either. But that being said, I absolutely love my watch. I’ve never worn one regularly before, but three weeks of wearing this one has made me an addict. Here are the ways in which I use it, and the ways in which I don’t. This is my favorite feature of the watch. I’ve never had a Fitbit or any other fitness tracker before, so I can’t give you a comparison, but I’ve found that the fitness/activity tracker on the Apple watch is intuitive and easy to use. A shoulder injury is currently keeping me out of the gym and off the mats, so I’ve mainly been hiking for exercise. I’ve used the watch extensively on these hikes to keep track of my distance and heart rate, and it’s worked beautifully. Sure, the iphone has the same program and could be used for distance tracking, but being able to glance at my wrist and see my mileage and heart rate is so much easier. Another great feature of the watch’s fitness tracker is the incentive system for movement outside of your formal exercise. You can set movement and standing goals, measured in calories and hours in which you’ve stood for at least a minute, and the watch will not only track these, but also send you a reminder when you fall behind on them during the day. I spend a significant amount of time at my desk, and these reminders have made a huge difference in breaking up my sedentary periods throughout my day. I’m much more likely to walk to work (2 miles each way), and take standing breaks throughout the day than I was before. The little rewards it gives you are kind of stupid, but the activity summaries are fantastic. 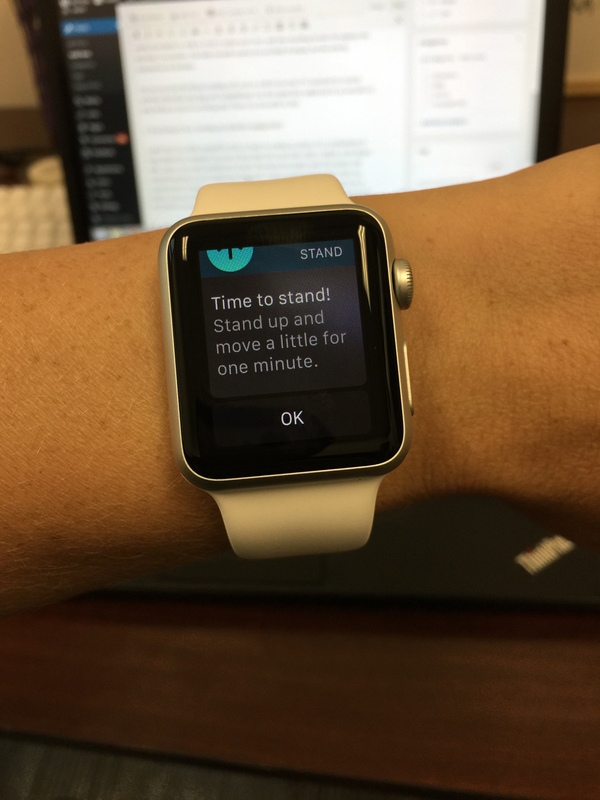 I just got a reminder to stand while I was writing this post. Meta! Could the FitBit do just as well? Maybe, although I’m not so sure. I went hiking with some friends and the aforementioned fiance last weekend, and when we started our four different fitness trackers, mine loaded the fastest by far, with just one button push and two taps on the screen. From that totally scientific comparison, I’d say the Apple watch is the winner. I’m not sure that the fitness tracking will work as well for me once I’ve resumed my normal activities (Brazilian Jiu-jitsu and weightlifting), but then again they might just be an incentive to keep hiking on top of everything else! There’s no downside to that. I’m really compulsive when it comes to reading my phone. It’s a combination of being addicted to reading during every free second, and being used to a constant stream of notifications from texts, Twitter, and you lovely people when you comment here or sign up to follow this blog (thank you!). Constantly checking my phone is obviously very rude when I’m at dinner with my in-laws, or giving a lecture, and so wearing the watch has become a good compromise. The watch lets me keep my phone in my bag without worrying that I’m missing anything important. I can see all messages and notifications as they happen, ignore most of them but send quick replies to people who are extra important. When I’m bored during meetings, I can do some limited browsing of twitter and my emails without looking too rude. This will probably change as more people get watches and realize what we’re all doing on them. Not every message needs an immediate response. The watch has limited application to lab work, but I can see the potential for much more. I’ve been experimenting with using Siri to set timers for me when I’m in the ancient DNA lab, dressed head to toe in protective clothing and trying to touch as little as possible to avoid contamination. It actually works pretty well! And I have it set up so that I get notifications via email from the server when my genome alignment programs are finished running, so I’m not quite so tied to my laptop. But that’s about all I can come up with for now. I really wish there were more ways to effectively use the watch in the lab, such as connecting it to thermocyclers to monitor my PCR runs, but I don’t think anything like that will be possible for a while. 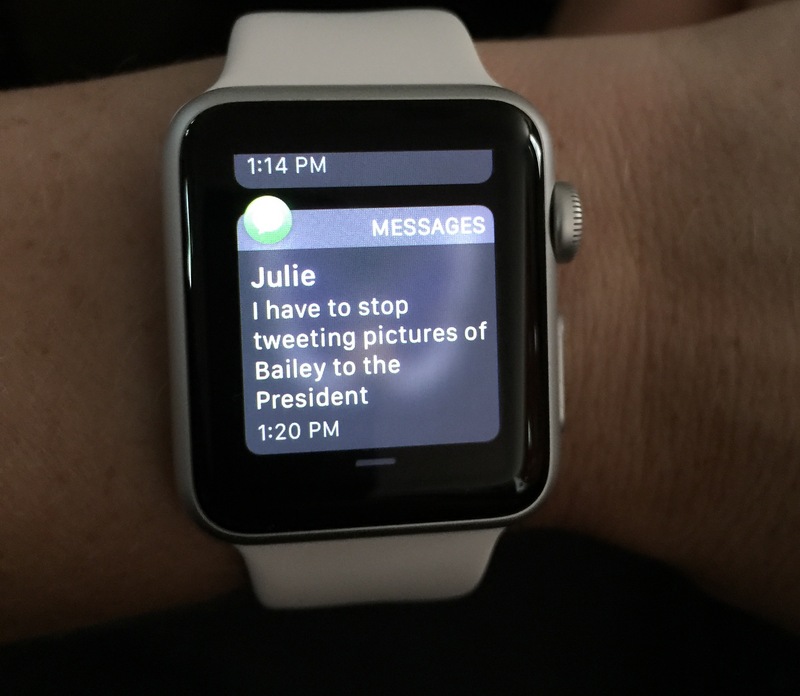 The Apple Watch is fantastic for scheduling. Since I’ve gotten it, I have begun explicitly scheduling my time on my google calendar into large blocks for things like “working on manuscript revisions”, “troubleshooting ddRad-Seq”, “writing blog posts”, in addition to fixed appointments like meeting with my mentor or going to physical therapy. This lets me get completely lost in a task without having to worry that I’ll miss something, as long as I’m good about updating my calendar. When it’s time to switch tasks, I get a little tap on the wrist. The Maps app is really, really nice. You have to load it up on your phone, but then you get a gentle tap on your wrist as a reminder when you need to make a turn. If you’re in the habit of listening to the radio loudly and sometimes miss your voice directions (ahem), this is a beautiful solution to the problem. Necessary? No. Convenient? Yes. Most 3rd party apps. Unless I’m really really bored in a meeting and desperate for covert distraction, I just don’t use apps like Instagram. They don’t work well at all. The watch isn’t a substitute for a phone or tablet. But I admit that I’ve been too busy over the last few weeks to browse the tech forums and really explore all the possibilities. (I did say this was a review for regular people, right?). So there might be some good apps available that I don’t know about. If you have suggestions, please let me know in the comments! Looking cool. As far as I can tell, I’m the only person on the UT campus who has one, but nobody ever notices. The only time a stranger has ever commented on the watch was at the Austin Maker Faire, and he got bored pretty quickly with my enthusiastic demonstration of its features. Maybe it’s a regional specific thing (everything’s different in Texas), but the Apple watch seems to be basically equivalent to a calculator watch in terms of coolness right now. Is it fashionable? I’m not the best judge of such things. I’m a big fan of minimalism–I wear what basically amounts to a capsule wardrobe, and ~85% of my clothing is black or grey, so the white band does stand out. I definitely think it’s pretty, although I might eventually try to get a leather band for more formal occasions. Sharing my heartbeat and squiggle drawings (aka “Digital touch”) Like many users, I don’t know anyone else who has a watch. My best friend has ordered one, but it hasn’t arrived yet. And I’m not interested in sharing my phone number with strangers on reddit to be digitally touched (ew!) , so I haven’t tried these features out. Travel: I’ve flown once since I got the watch, and it didn’t occur to me that I could have loaded my boarding pass onto it until a gate attendant noticed it and asked me whether I had. I started awkwardly fumbling with the app and my account and couldn’t manage to get it loaded before my time in the line was up. The gate attendant laughed and told me that of all the people he’d seen fly that day, only two other people had the watch (both ladies), and they found that trying to get it scanned put their wrists in a very awkward position. In the interests of investigative blogging or whatever, I’ll try to get my boarding passes onto the watch in advance of my next trip in a few weeks, but I strongly suspect that this is another thing better done with one’s phone. If you are interested in buying the watch, I see absolutely no reason for you to buy the more expensive version. The sport version is rugged and comfortable and really nice. The voice transcription is surprisingly good, and the animated emojis are weird and creepy. It’s incredibly fun, although not very practical, to use the watch as a phone. I’ve done this a couple of times, and the microphone is really not great in a noisy area. But you feel like a spy doing it. Part of what makes the watch so pretty are the faces, and they only appear when you raise your wrist. I understand that is probably designed to conserve battery life, but I really wish there was an option to make the face visible longer, or even permanently. Speaking of battery life, I haven’t had any issues with mine. It lasts all day for me. So in summary, the Apple watch is great simply as a watch, and although it’s changed my life in small but meaningful ways, I don’t know whether any other smart watch wouldn’t do the same. My partner insists that his Android Wear watch is superior, but his hatred of Apple products is reflexive and a tad hyperbolic. I think that once the third party app developers really get going, this device will be fantastic. In the meantime, I’m in love with it, but definitely wouldn’t recommend anyone buy it unless they have a bit of extra cash and want a frivolous treat. It’s not essential, but owning one doesn’t automatically make you a tool. (I hope). In case it isn’t obvious, I wasn’t paid for this review, nor am I interested in writing solicited reviews. If you have any questions for me, or suggestions for how to use the watch, feel free to comment and give me a tap on the wrist! I have an Android Wear watch, and my reactions are about the same. It’s pretty neat, but a bit expensive for what it does. The fitness app isn’t quite as full-featured, and the Maps app doesn’t buzz my wrist (though that may be a settings issue, I haven’t investigated). But overall I use it for pretty much the same things you mentioned. Fair enough. Like I said, I think that any smart watch is about the same at the moment. Knowing apple, I’d gamble that they’ll pull ahead with innovative apps, but that just hasn’t really happened yet (except for the fitness app). We’ll see if my prediction is correct! Jennifer! You’ve got a fiancé?!? I’ll include some IRL stuff in the next e-mail about computers I don’t want out there for public consumption (like how to have good Apple stuff when you’re as financially challenged as I am), but years ago I managed a little computer rental company in the days of Windows 3.1 and DOS 4.0. When I left, I couldn’t see getting one of those contraptions. I wound up with an aging Apple IIci courtesy of my sister (a former exec at a Fortune 500 Company), and in reading most of the computer mags at the time, it was always “Apple Death Watch,” and “Those Things are Dinosaurs!” doomsaying. Except for the Mac publications, of course. They were making some really bold predictions and were consummate optimists. Those folks knew something, seriously. My take is the Apple-haters are acting out their guilty consciences over how wrong they were back then; that’s all. They probably need some unconditional support of the “We all make mistakes” variety. Incidentally, I don’t have an iPhone and won’t be getting one, or a watch, either, alas. I’ve got my reasons, but I’m giving serious thought to an iPad, though, just because bringing my big MacBook Pro to social situations is a bit clumsy.